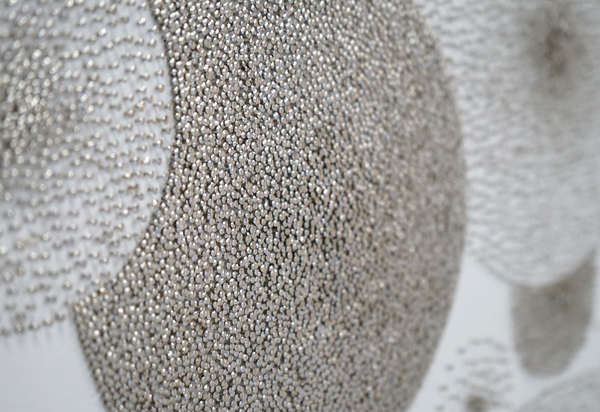 We had the great pleasure of visiting the Pace Gallery pop-up in Menlo Park, CA to see Tara Donovan: Untitled. 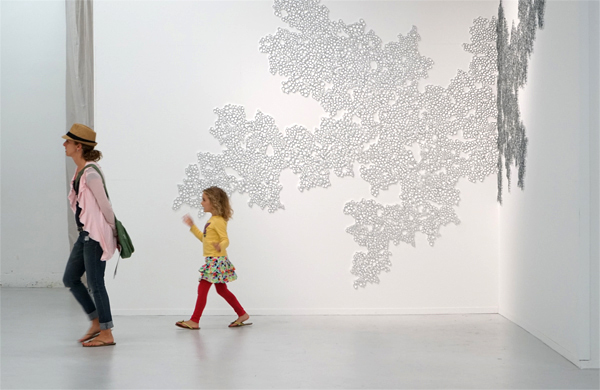 If PACE sounds familiar to you, PACE is a well-established NYC gallery that represents work by artists such as Alexander Calder, Sol LeWitt, Maya Lin, Pablo Picasso, James Turrell, and Kiki Smith. In short, they’re not messing around. 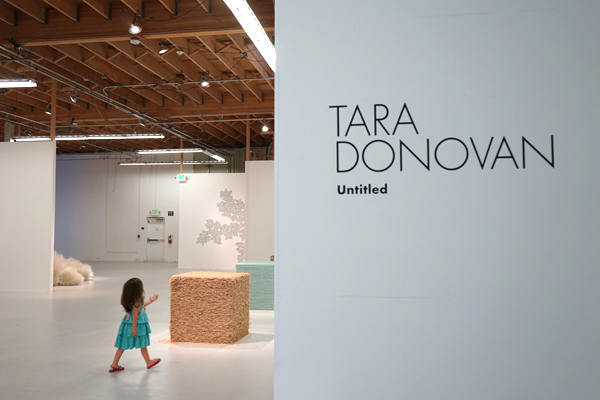 The gallery is housed in the former Tesla car showroom, and the make-shift space added an element of spectacle to the exhibition. 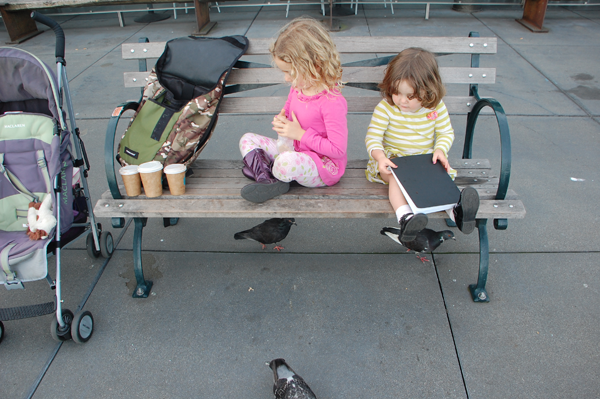 My three-year old took this afternoon as a chance to practice her tour guide skills, and we were off! 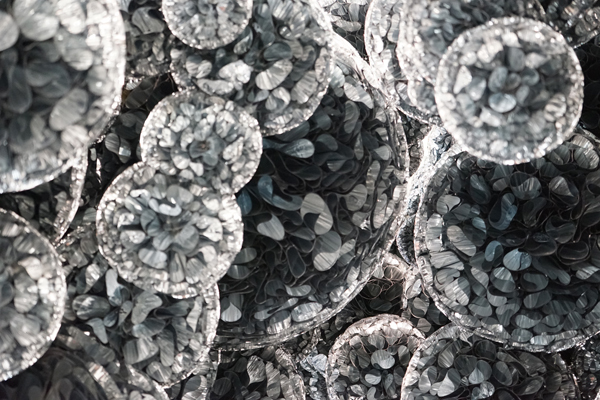 First up, these incredible orbs made from rolled mylar. 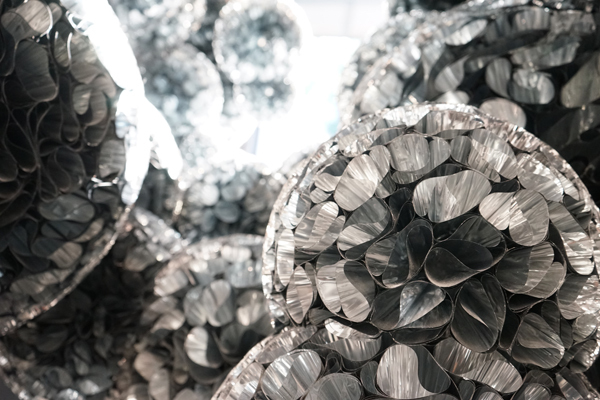 One of the more striking things about Tara Donovan’s work is how she repurposes manmade objects into organic forms. Donovan’s sculptural installations were just the thing to help us practice perspective-taking. We spent a lot of time looking at works of art up close and then far away. 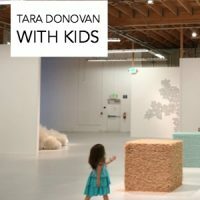 Because we had most of the galleries to ourselves, my kids took many opportunities to get up close and personal with the art. 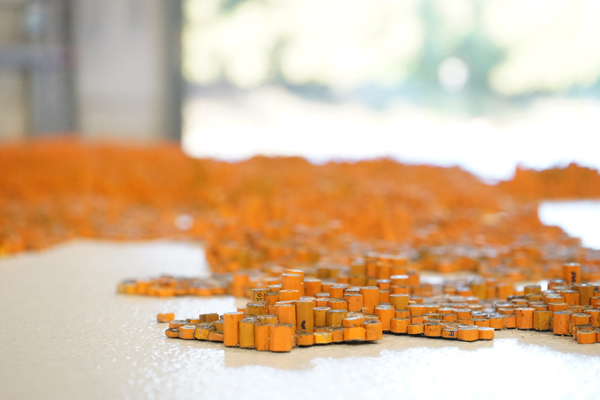 Can you tell what this installation (below) is made of? How about with a closer look? While it doesn’t photograph as well as it looks in person, this piece (below) was spectacular. It was a wall of clear straws, layered one on top of the other. The straws were then formed into rounded waves that popped from the wall at different distances. 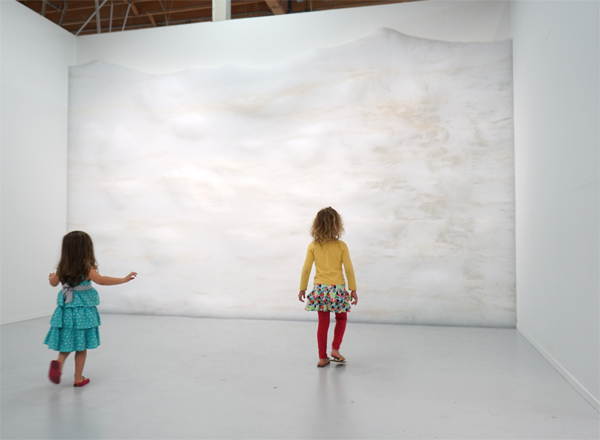 Walking back and forth along the wall created implied movement in the piece, and it was mesmerizing. And the guards, I almost forgot them! As you may know, I used to work in museums. The San Jose Museum of Art, where I last worked, had the most incredible guards who were all trained to be…friendly (gasp!) and talk with visitors about the art. I’m seeing more and more of this now, and was so impressed with the warmth of the PACE guards. They were lovely! Can you tell what this next piece is made from? Take a good look! How about now? Isn’t that great?! There’s a comprehensive reading area with catalogues from most (if not all) of the PACE artists represented. 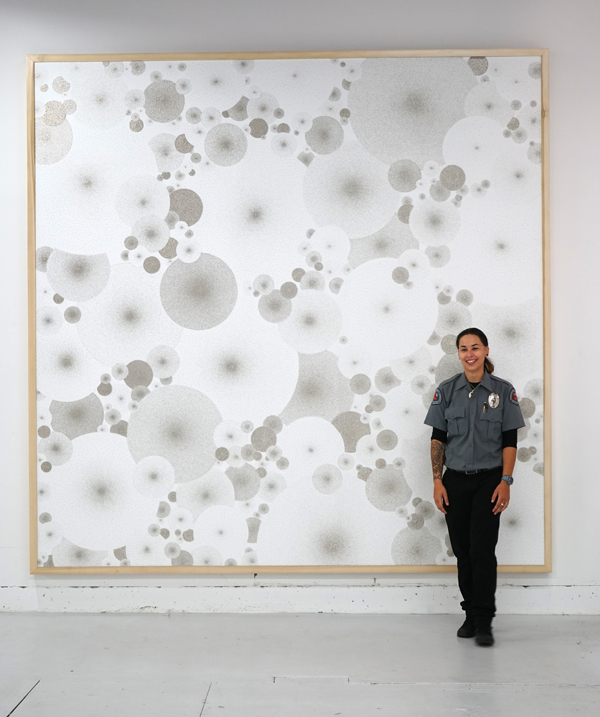 Tara Donovan started working with materials such as toothpicks and buttons out of a need to make art on a very tight budget. 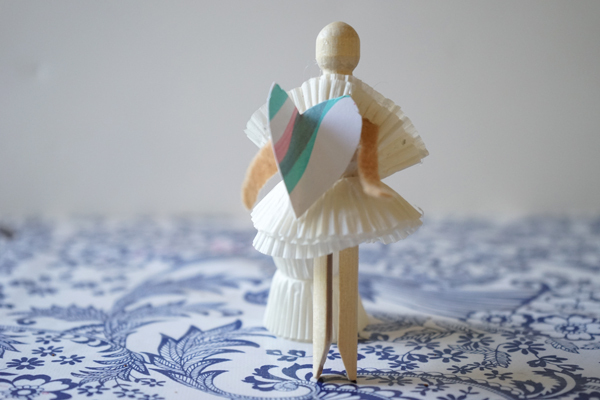 She’s since become a master at using inexpensive, everyday materials to build organic forms. A few days after visiting the show I brought out some mini cupcake liners and white school glue, and we got busy upcycling these materials into new objects. So fun! 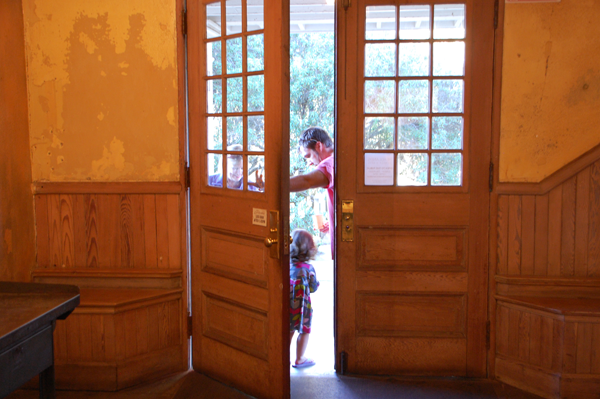 What was the last gallery or museum that you visited? Can you remember the last show that you were inspired by? This show takes the cake for me! Today is the last day of school for my kids before the start of summer. Not only is summer a school-free time for many children, but it can also mean warm weather, long car trips, digging up lots of beach sand, and long empty hours to lollygag (my favorite pastime). 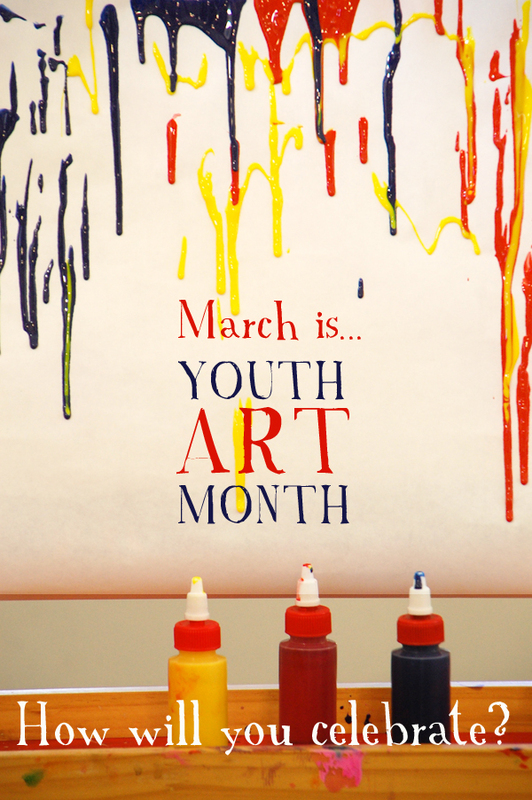 While we often think of creative activities for kids as easel painting or drawing, getting outdoors fills children with new ideas, an imaginative spirit, and a thirst for life that will give children fodder for their ideas and art making. 1. At the Beach. 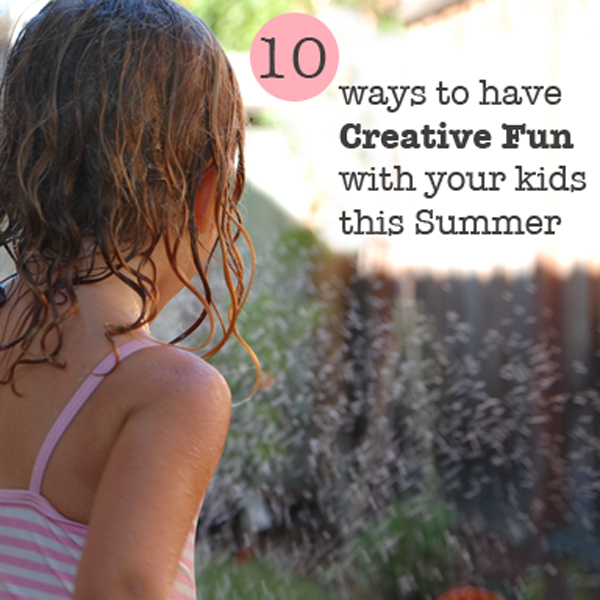 While many parents look forward to beach trips as an opportunity to relax while the kids play (me, me!! 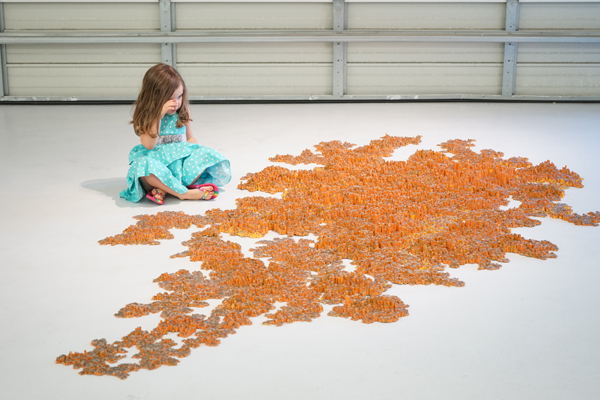 ), you can take comfort in the fact that while children play they are filling their brains with the sensory experiences of playing with sand, architectural processes of building castles, and physics lessons in how waves and tides move. 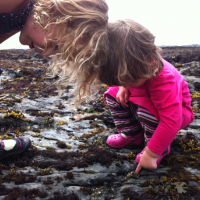 We love the beach as a spot for the creative adventures that always go along with tidepooling, and look forward to trying our hands at sandcasting with plaster of paris (via The Artful Parent). 2. During Long Car Trips. Are you dreading planning a long car trip this summer? 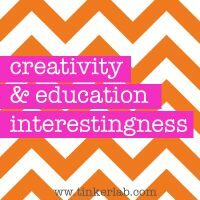 While DVD’s do wonders for keeping backseat bickering at bay, hands-on activities not only keep the mind active, but they can encourage long, uninterrupted spells of creativity as well. 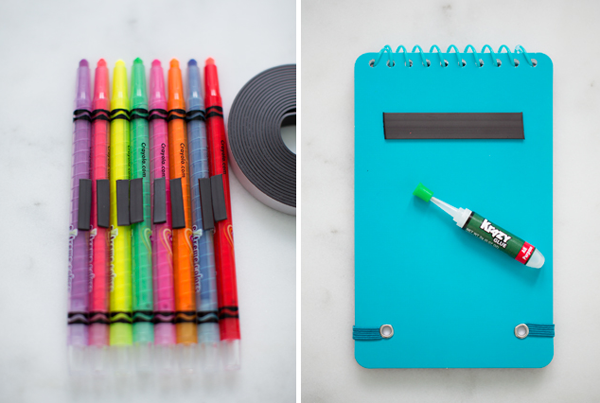 We always put together a travel art kit like the Itty Bitty Art Kit for Little Travelers. These are a key to happiness, both on the road and once we’re at our destination. To keep everyone’s mind occupied and on the same page, you’ll enjoy this awesome list from MPMK of audio books that the whole family can enjoy. MPMK also shares the brilliant idea of making a DIY Car traveling station (photo, above). It’s magnetized so that materials won’t fly all over the car. Once you see this you won’t want to go back to your old methods. 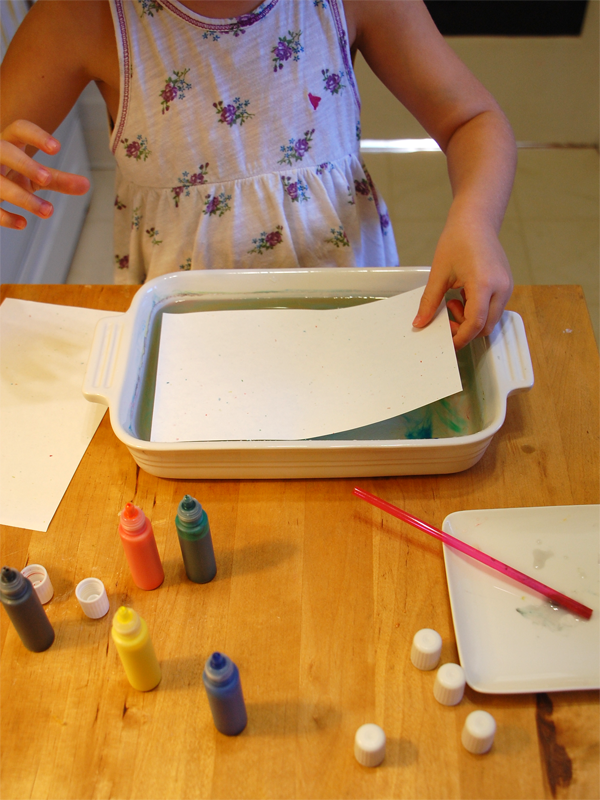 Related to that, The Imagination Tree shares this how you can repurpose a simple plastic tray into a drawing station with window crayons with this clever DIY Portable art board. 3. At the Campground. 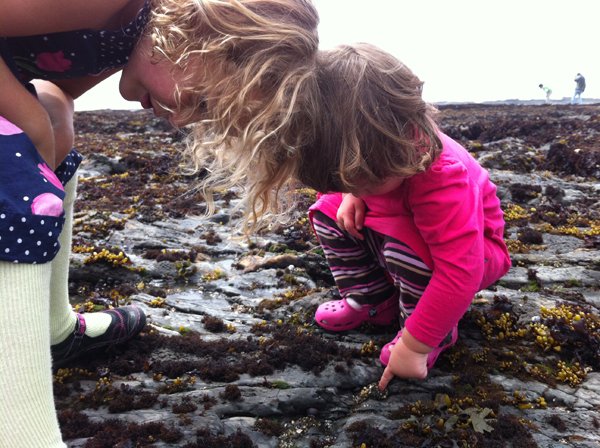 Getting outdoors and taking adventures do wonders for eliciting creative thinking. 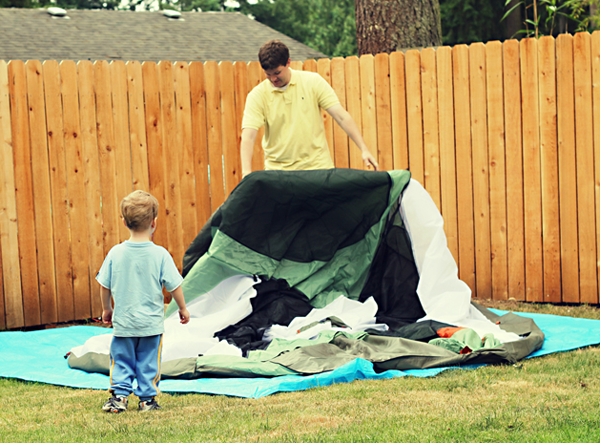 If you don’t have any grand plans for camping this summer, not to worry because you can always pitch a Tent in the backyard and make sun-baked s’mores (via Kids Stuff World) on a hot day with creature comforts not too far away. Mmm. Now, if you can actually manage to pack up all your gear and head out to the woods, This Mama Makes Stuff offers some sage advice on how to make the most of camping with kids. The Creative Homemaker shares a Happy Camper Scavenger Hunt (with a free printable that’s super cute) that will encourage children to look carefully at the world around them. Speaking of scavenger hunts, you don’t have to go very far to find cool things to look at. Just walk out your front door with a camera and you’re ready to take a rainbow scavenger hunt or any other sort of scavenger hunt you can dream up. 5. On the Hiking Trail. And then we can always kick scavenger hunts up a notch! 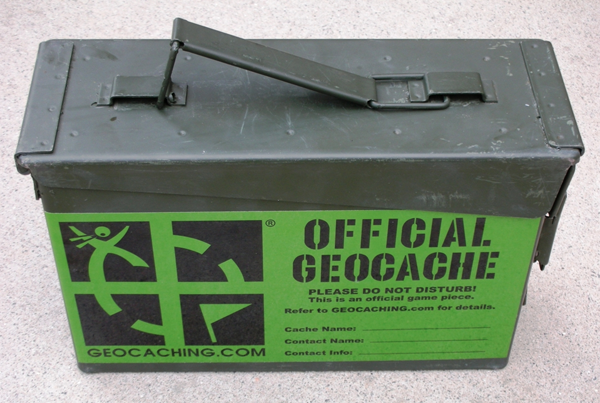 Have you ever been geocaching? When geocaching was first introduced back in 2001, I was one of the first people to go out and buy a GPS. And my husband laughed at me. We planted one of the oldest caches in Southern California and then the first cache in Indonesia, and wouldn’t you know that they’re both still there! Now geocaching is so easy and affordable with phone-based apps like the Geocaching App for the iPhone. 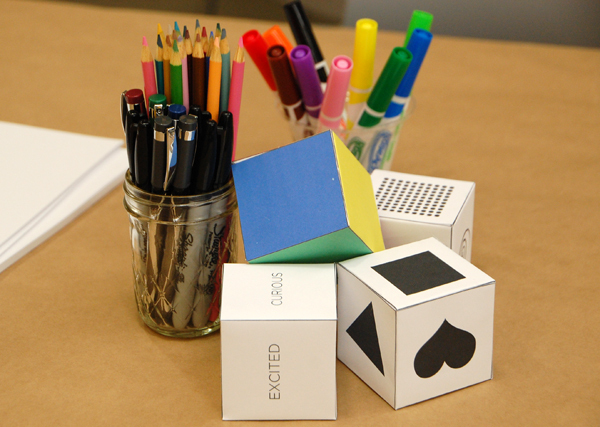 This activity gets kids moving and encourages them think hard as they go back and forth between connecting coordinates with real-world landmarks. Not only that, but it’s fun for everyone in the family. I can’t recommend it enough. Hmm, all this cache talk reminds me that it’s been ages since we’ve hit the trail. I’m adding this to our summer list! 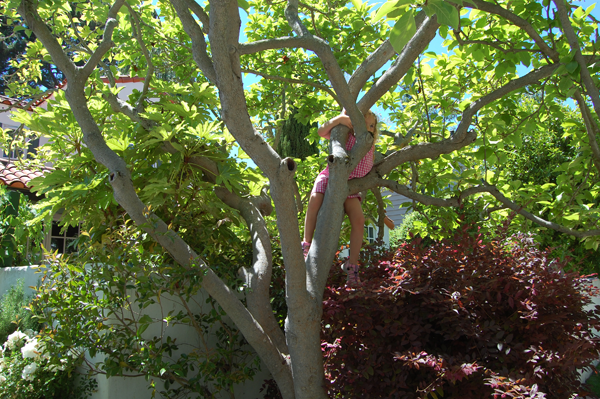 Did you know that climbing trees can support creative thinking? 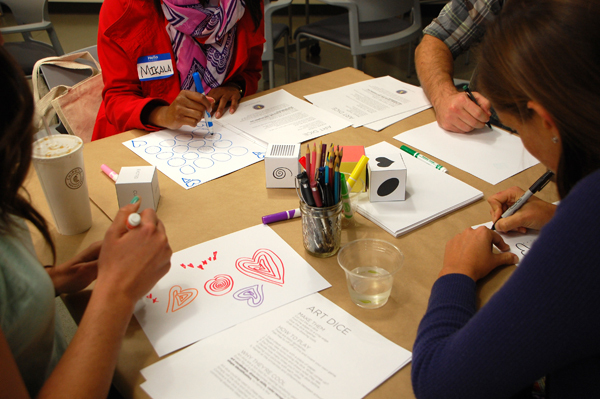 And then there’s the DIY Art Camp. 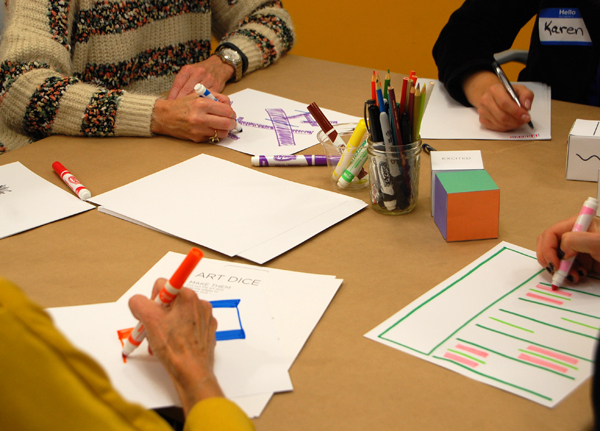 If the weather is nice, why not invite your friends to join you for some art-making at the park? 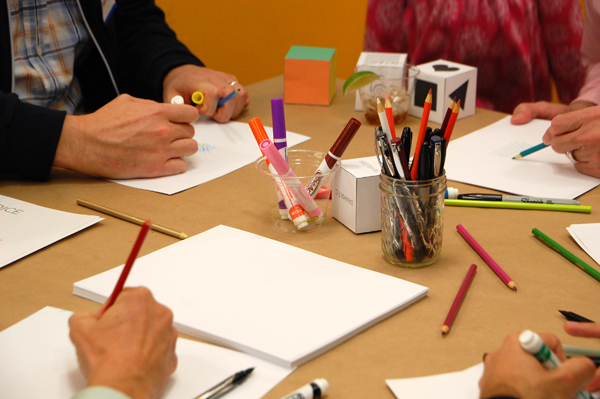 A couple summers ago we hosted a summer art afternoon for some friends. After a picnic (kids need fuel for the brains), we made sand paintings, paper bag crowns, and summer fireworks tote bags. Put engineering skills to work by making your own boats like these from NurtureStore, and then test them in the lake, pool, or stream. Whether you have a large plot of land or a tiny patio, a short walk out your own front door into the fresh air gives children a low-threshold opportunity to get close to nature. 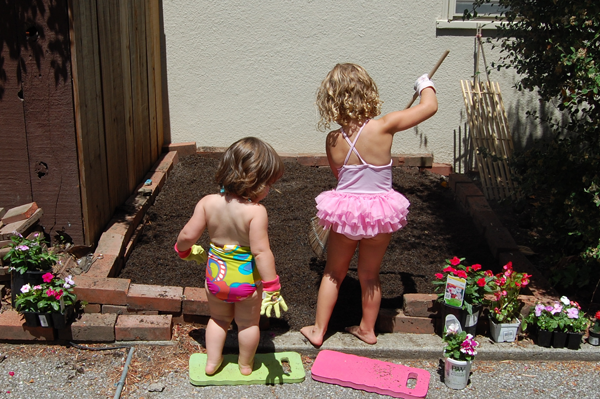 You could try making your own Water Wall, planting a Garden with the Kids, easy outdoor water painting, set up an impromptu garden art studio, or make fairy gardens for your resident gnomes and keepers of pixie dust. 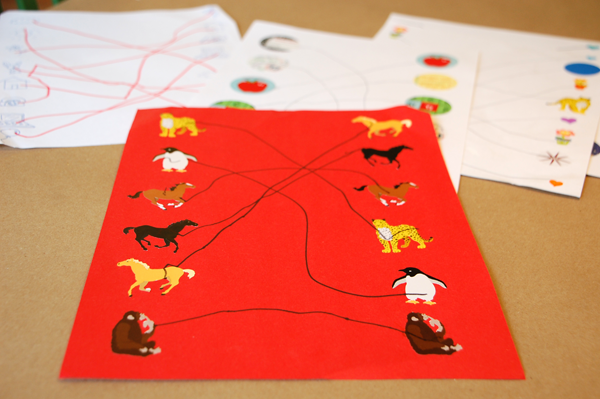 Make a stack of these matching games (photo above) ahead of time. If you’re traveling with a Lego-fan, and you have some skill with a sewing machine, this fabric tray Lego base is gorgeous and brilliant. Now if only there were a way to wrangle all those Legos on the plane! Before you travel, your child may enjoy pretending that he or she is taking a trip or setting up a travel agency. This does wonders for building excitement (as seen in these pictures!). Have you ever organized or gone on a mystery trip? They’re so fun, and can make even the most ordinary outing an adventure. 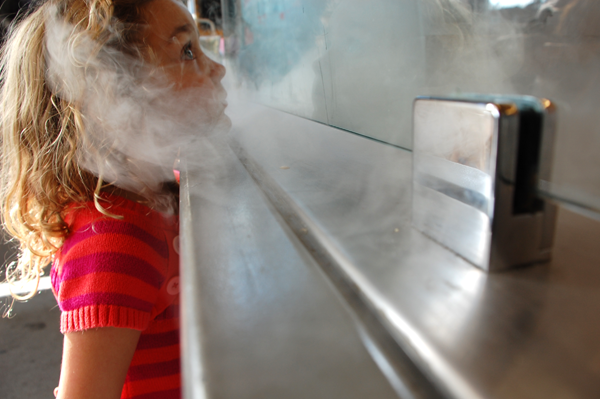 On this recent trip to San Francisco, my husband wanted to introduce us to a Smitten, an ice cream shop that makes fresh ice cream, while you wait, with liquid nitrogen. Cool! (sorry I couldn’t help myself). Adding to the cool factor, Smitten is located in a recycled shipping container in one of our favorite spots for people watching. Scott kept the whole thing to himself and then wowed my 4-year old with the adventure of watching her ice cream come to life. To arrange a mystery trip, announce that you’re planning one, let your party know if they need to come prepared with any special clothes, snacks, or other creature comforts. And then hit the road! On that note, enjoy the great outdoors and know that that spending time outside is one of the best things you can do for a child. 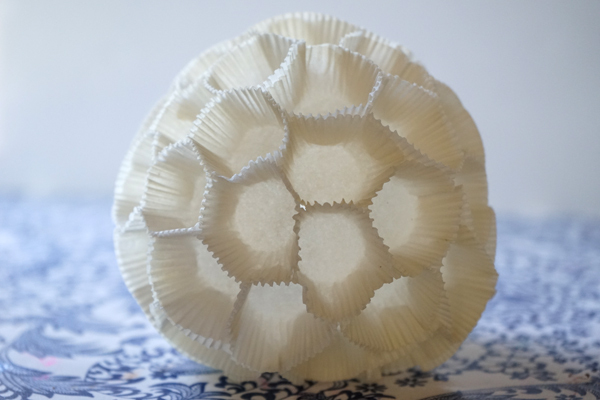 Marbleizing paper is a gorgeous craft that will awe even the most jaded maker. As a child, I always wanted to know how to marble paper. Kids and adults adore this magical technique. Today we’re using special inks that really simplify the process. I know you’re going to love this! The process used here is suminagashi. What’s the meaning of suminagashi? 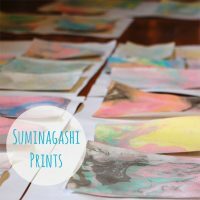 The beautiful word translates from Japanese to mean “spilled ink.” I love saying suminagashi, and hearing my kids try to say it is a-dorable. Suminagashi is traditionally done with Sumi Ink, which is oily. Since oil floats on top of water, guess what? So does the Sumi ink! The process is simple and beautiful. I’ve been saving this Suminagashi kit for a quiet morning and it was a true winner with both my 2-year old and 4-year old. Although the kit is recommended for ages 6 and up, both of my children handled the dyes well. My 2-year old needed a little help, so I wouldn’t let the age thing stop you if that’s a concern. 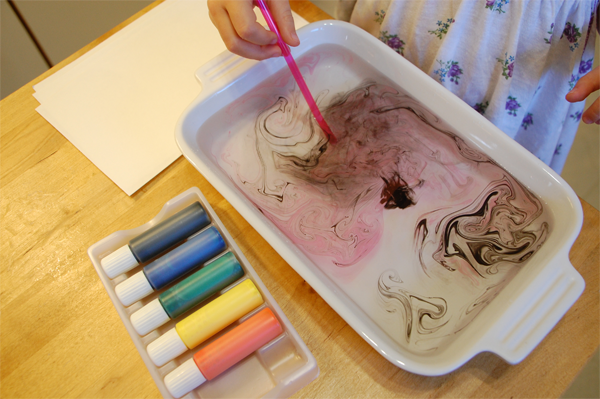 Squeeze a little bit of color into a tray of water and swirl it around. Color mixing is okay! Gently lay a piece of paper on top. Leave it for a second, pull it off, and you have a print. This is one of those projects that’s tough to stop at just one. Because each print is unique, it’s compelling to try multiple variations on the theme. This kept us active for a good hour! 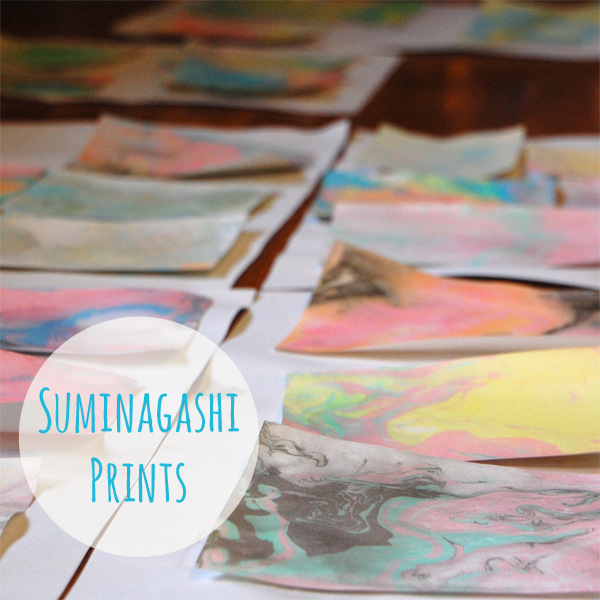 Once dry, my 4-year old turned these beautiful marbled papers into cards for her teachers. 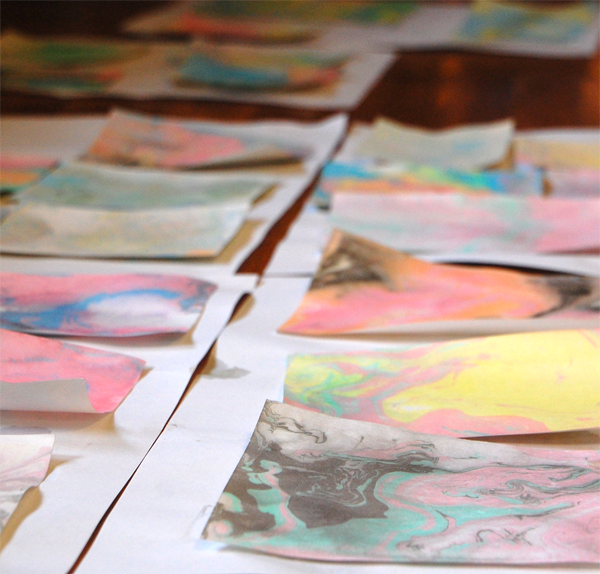 If you’re interested in another version of this experience, we did some marbling experiments a couple years ago with spectacular results: Marbleized Paper with oil and liquid watercolors. Inner Child Fun shows how to make gorgeous concentric circles — I wish we had tried this ourselves. Next time! If you know a little bit about me and my parenting philosophy, you’ll know that I welcome opportunities to get my children into DIY mode. The only way they’re going to learn how to do something is by getting involved, so I may give them a few pointers and then I’ll step back and let them take the lead. Not only do I also drool over vanilla cake, but this simple request made for a totally low-key, low-stress birthday that I look forward to repeating again with future birthdays. To get started, my 4-year old, N, and I mixed up one box of vanilla cake mix from Trader Joes. It doesn’t get easier than that, and the ingredients are actually fairly healthy. 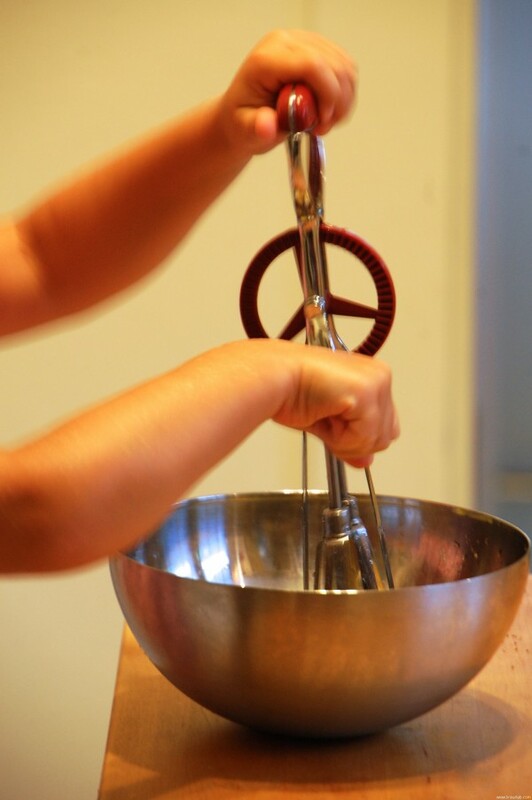 We pulled out our rotary hand mixer/egg beater , which my daughter uses any chance she can get. 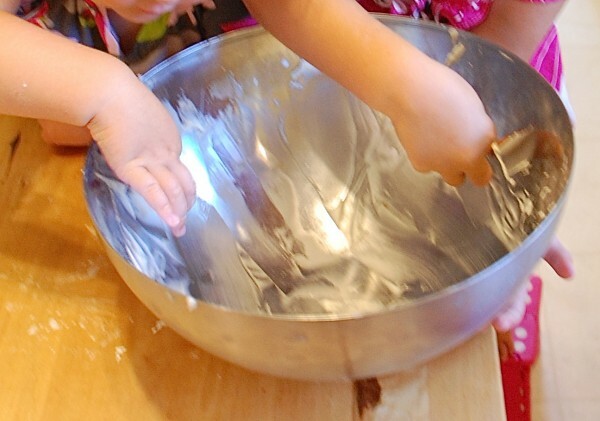 Not only is it fun for kids to use, but it gets them involved in the kitchen and it does wonders for developing hand-eye coordination and motor skills. 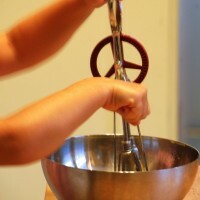 After she mixed the batter up, we divided it into two 9-inch cake pans and cooked as directed on the box. 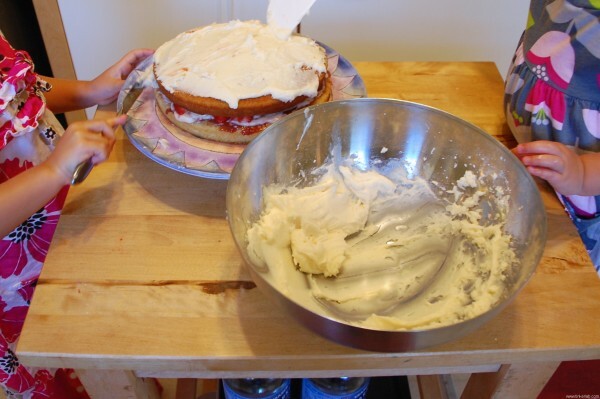 Meanwhile, we mixed a batch of our favorite frosting: Buttercream Frosting. Oh-my-goodness. 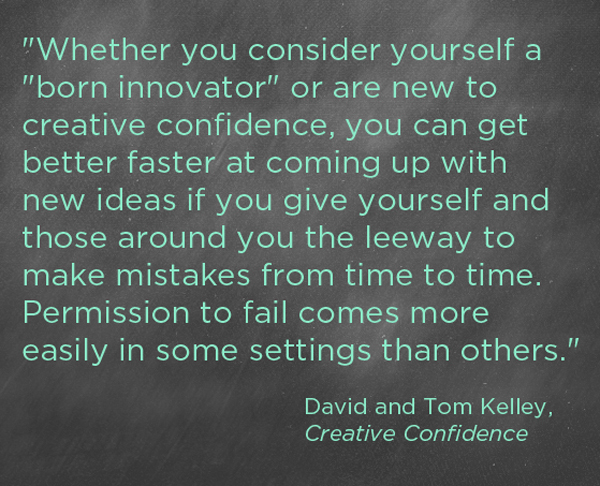 If you’ve never made it before, it’s not only easy, but it’s also highly addictive. Yum. My kids are always promised a beater to lick at the end of baking, which helps keep hands out of the bowl while we’re assembling. Once the cakes cooked and cooled, we popped them out of the pans and started in on our grand assembly plan. My 4-year old’s plan: Two-tiered vanilla cake with vanilla frosting and strawberries in the middle layers. The top will be covered with sprinkles, Happy Birthday letters, a “2” birthday candle, and fairy cupcake toppers (basically, everything we had in the cabinet). Decorating Step 1: The kids used butter knives to cover the bottom layer with raspberry jam (this was my suggestion, and they did not protest). Then we added a thick layer of vanilla frosting. 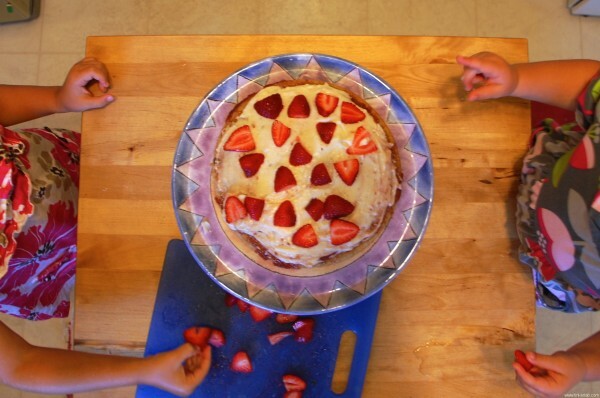 Decorating Step 2: My 4-year old thinly sliced the strawberries and the kids layered them on the cake. We placed the second cake on top of the strawberry layer, and then covered the whole thing with frosting. 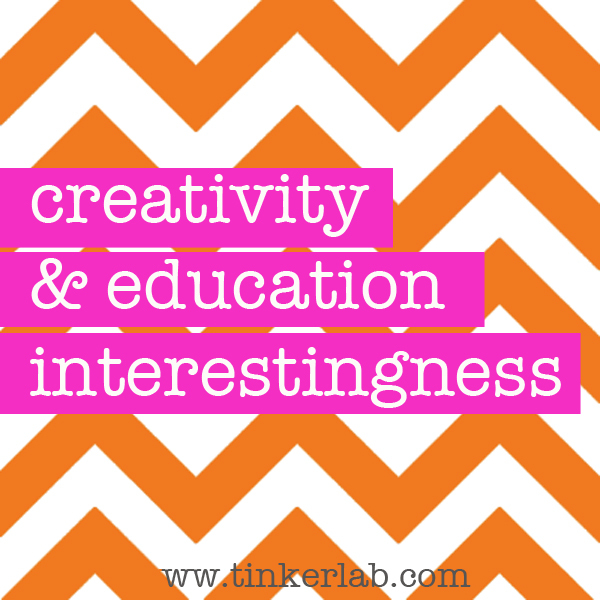 When you’re working with children, it helps to value the process over the product. You can’t worry too much about how the cake is going to look. It’s a bonus, of course, if it looks amazing, but the important thing is that they have take pride in make something amazing happen. We started gussying the cake up and R requested jelly beans. There were only six left in the box, and she eagerly plunked them into a corner of the cake. This ended up being her piece! And when we were done, they got the frosting bowl as a bonus. 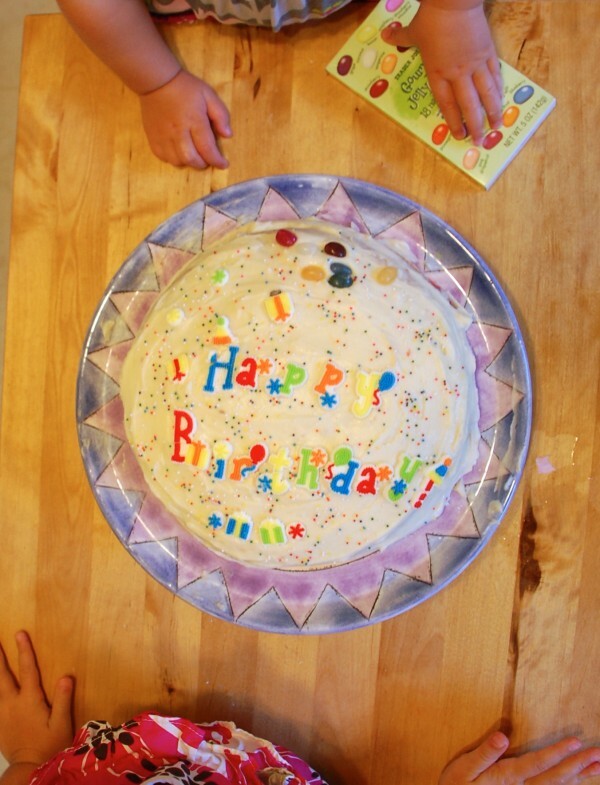 Also, one of my friends and favorite bloggers, Jean Van’t Hul of The Artful Parent recently wrote about a birthday cake her daughter made: A Kid Made Birthday Cake. I think my kids would feel right at home in her house! DO YOU LIKE TO COOK WITH YOUR CHILD? 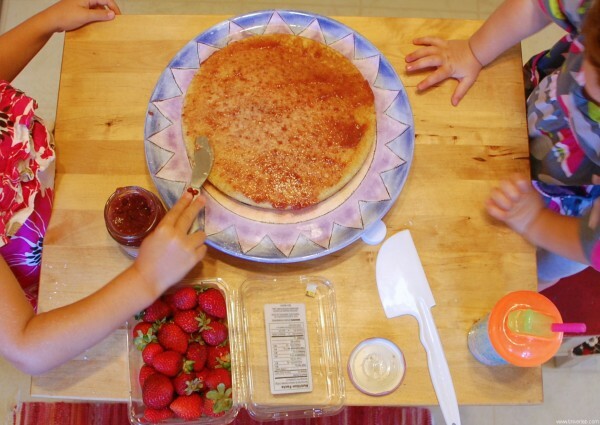 WHAT ARE YOU FAVORITE COOKING-WITH-KIDS RECIPES?